The reason you may have to adjust your mixer is that during the manufacturing process, KitchenAid stand mixers are set for the beaters to just clear the bowl when mixing. However, this clearance may need to be adjusted so that the beaters are closer to the bowl during the mixing process, without coming into contact with the bottom or sides of the bowl. 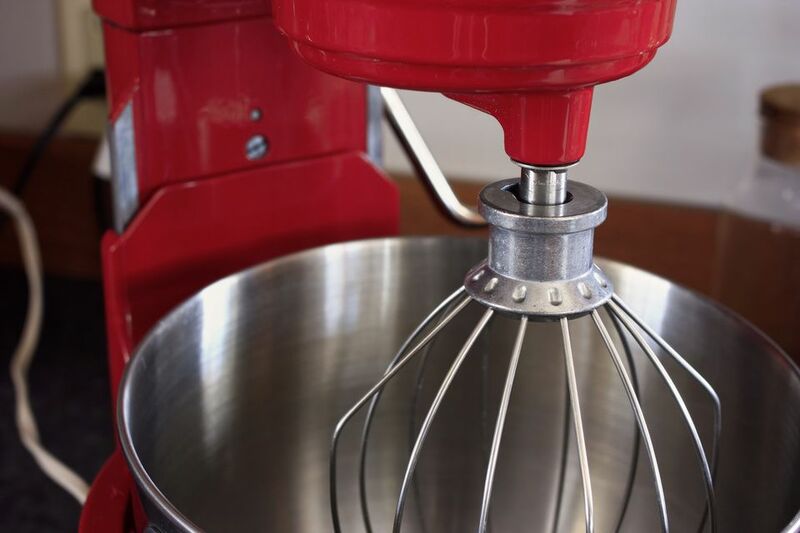 When the mixer is adjusted properly, the mixing action pulls all the batter in from the sides and bottom of the bowl, leaving minimal scraping required. Tilt-head models have a screw just below the area where the head is attached to the stand. You'll need to unplug your mixer and tilt the head up to find the screw. A slight clockwise (right) turn will lower the beater and a counter-clockwise (left) motion will raise it. Bowl-lift models have an adjustment screw on the lower portion of the stand and you'll need to place the bowl's lift handle in the down position to see it, after unplugging the unit. The adjustment to lower the beater is clockwise (right), while the adjustment to raise it is counter-clockwise (left). When testing your adjustment, you should use the flat beater to ensure it just clears the bowl. If you've over-or-under corrected, the bowl may not lock properly in place, or you may hear the beater hit the sides or bottom of the bowl. If this happens, you may have to counter the adjustment slightly to correct it. These instructions also work to properly seat a BeaterBlade mixer attachment on your KitchenAid mixer. Having the beater in the correct position is very important. If the beater hits the bowl, the finish could get chipped, which will affect cleaning, and this added stress can also cause problems with the mixer motor.